Nobody ever promised this would be easy, especially when it came to installing POGO, our one-of-a-kind vertical profiler system (VPS). First deployed in August 2009, the original winch motor did not last the winter. We were able to extend the instrument float upward, but we could not retract it back to the base platform. So, POGO sat it out on the seafloor (396m depth) until we retrieved it in May 2010 (See related video.). Technicians from Nichiyu Giken Kogyo (NGK) replaced the motor and refurbished the entire platform for re-deployment, September 2010. This time, POGO was ready for action, but problems with an electrical connector prevented us from powering the platform. Once again, we recovered it to ship and brought it back to our technology centre for the winter. 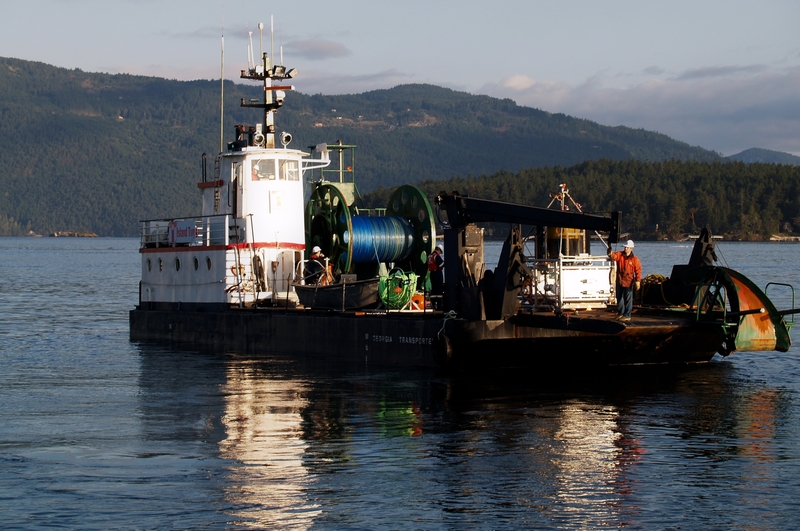 The faulty connector has now been repaired and POGO re-deployed, this time to the bottom of Saanich Inlet, near Sidney BC, for several weeks of intensive testing. This test deployment is a collaborative affair. 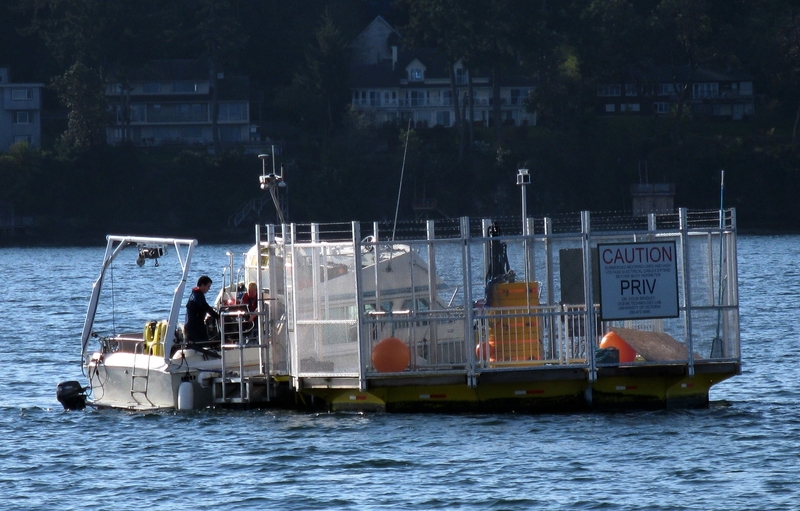 POGO is connected to the University of Victoria’s Ocean Technology Test Bed (OTTB) buoy in Patricia Bay near Sidney, BC. OTTB, in turn, uses power and communications via connection to the Saanich Inlet node. Adrian Round, VENUS associate director of engineering & operations, oversaw the deployment from Island Tug’s Georgia Transporter, a cable-laying barge. He was assisted by staff scientist Steve Mihaly, contractors Kim Wallace and Jason Williams, Emmett Gamroth (OTTB) and the Island Tug crew, Don Lynum, Cam Reid, Barry Grimard, Ferdi Van de Kuijlen and Geoff Ruddick. First, POGO was slowly lowered by rope to the seafloor at a depth of about 80m. OTTB technicians Alison Proctor and Jeff Kennedy used their Remotely Operated Vehicle (ROV) to open POGO's deployment bales and inspect the VPS site. Emmett Gamroth then transferred the free end of the power and communications connecting cable to the OTTB buoy, and plugged it in, allowing VENUS and NEPTUNE systems people to remotely switch on the POGO winch and 11 attached instruments. Initial test results have been positive. The docking mechanism is working, having been docked and un-docked repeatedly. The winch is also working; many dozens of 60m profiles have been successfully completed. All of the instruments are working, and 90% of the data products are now in commissioning, with the remaining ones in development. 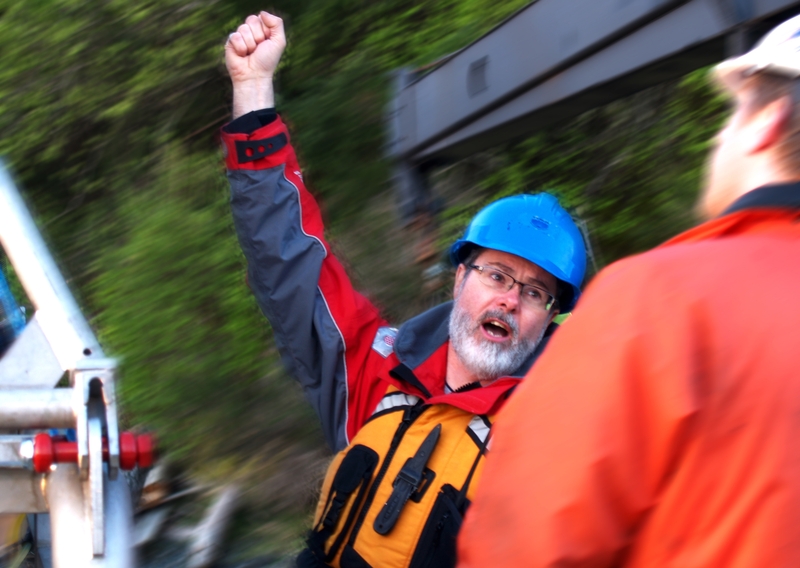 POGO will stay in Saanich Inlet for a couple more weeks, as we continue testing and data product commissioning. We’ll then retrieve it again, and if all goes well (knock on wood! ), we hope to re-deploy POGO to Barkley Upper Slope by next year.